Can you tell how much I am enjoying the Halloween month?? Yes! I am a BIG fan of Halloween and I’m not afraid to admit it! It’s the perfect time of the year when I could make food that looks dead, gross, bugged or dismembered. You know, the other day, I just got contacted to be featured in a magazine. Can you believe that? And it was fashion magazine. They said their theme for the next issue was about food and travel. I was kind of expecting someone to come out from the back of my door screaming that I just got played but nobody did. They were asking me to bring some clothes and accessories with me. AND…. I. don’t. wear. shoes. Okay, so what does that tell you about my fashion sense? Yes. It is zero, nada, zilch. So in line with this surprising self-discovery, I am listing my first EVER New Year’s Resolution: Update your wardrobe, Peach. Buy something other than shirt and jeans. 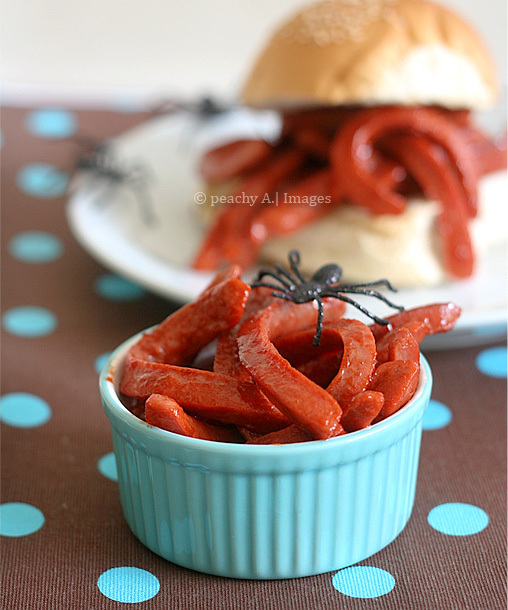 Alright busy moms, just like the SEVERED FINGERS I did last year, here’s another thing you can do to hotdogs and ketchup which I’m sure you always have at home. Make this squirmy Worm Sandwich. You might hear a few eeeeeewwww sounds from your little ones but once they’ve tried this, it’ll be replaced with mmmmmm. Heat oil in a non-stick skillet and fry hotdog strips until it curls. Toast hamburger buns in the oven for a few minutes, you can put sliced cheese then put some of your curled hotdogs. It would seem like they were worms and would shock the kids..or your guests. If you must know, I declined on the magazine feature. October is busy attacking my life. 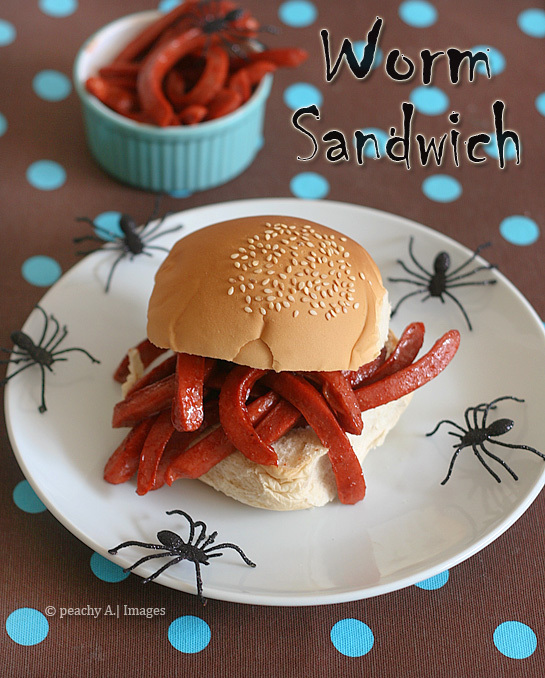 Definitely making some worm sandwiches, my boys are going to love this! Pretty gross but cute! I can definitely see the little ones getting a kick out of it. When it comes spooky ideas, I have to refer you. You make it really beautiful way. Oh no! Why did you decline?!!! very interesting, so nice, my daughter would really love this. First, congratulations on being featured by the magazine. That’s so cool. 🙂 You’re so creative. I love these worms sandwiches. hehe…I bet my kids would be super excited to try them too. By the way, I think shirts and jeans are so comfortable. I think 90% of the clothes inside my closets are shirts and jeans. hahaha…the 10% are more formal and decent ones and some dresses. But I wear the jeans and shirts 99% of the time. hehehe….can’t wait to see what you’re going to add into your closet. Will you share? Cute idea!! What is banana ketchup? 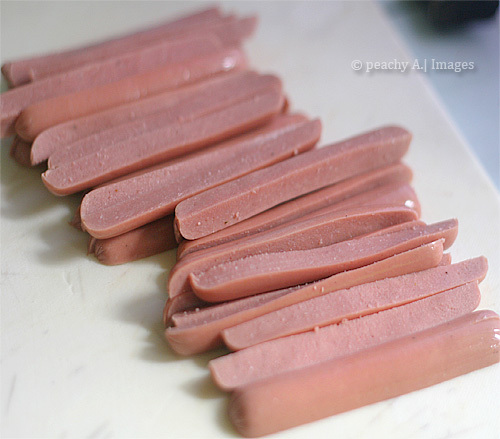 Those don’t even look like hot dogs! How cute! What a precious idea, my Wednesday Night Church Kids are going to just love this. Hope you are having a great weekend and thank you so much for sharing with Full Plate Thursday. very creative! 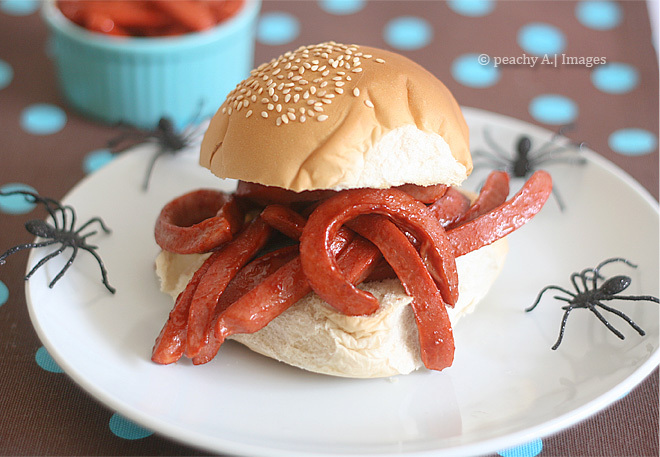 I think I should try preparing this on Halloween. might try this one for halloween haha 😀 Thanks for the idea! Love it! Wish I had found you before Halloween! Thanks! Just come back next year, then. Do you have to use banana ketchup? What about regular ketchup? Oh you can absolutely use tomato ketchup.. my family just love banana ketchup.